MAA is a non-profit organisation founded and incorporated as a charitable entity in 2003. Our members are ethnic Chinese from China , Hong Kong, and Taiwan plus a number of Pakeha, Koreans & Indians. We aim to use music as a bridge to enhance communication amongst members, to take part in music activities, to reinforce, support and heighten opportunities of music participation in our communities. We also provide a platform, through music, for new migrants to integrate with people of the mainstream community. The Association is devoted to developing diversity of different cultures in New Zealand . MAA have a group of loyal committee members who are the backbone of our organisation. For a non-profit group that relies on volunteers, the team-work between these members is integral to progress and to maintain a good relationship with our community. In 2006 we initiated the Quartet Composition Competition for young composers in collaboration with the Auckland Philharmonia Orchestra, and in 2007-8 we organized a concert, sponsored by Asia New Zealand Foundation and Creative Communities NZ Auckland City, combining western and Chinese/ Indian musical instruments, a new concept for young composers under twenty years old in our communities. In 2009 we are delighted to work with Manukau Symphony Orchestra to mark the monumental 70th-year milestone of the “Yellow River Cantata” which is a very successful celebration concert! In May 2011 invited to participate at 2 “Journey” concerts at Town Hall and Telstraclear Pacific Event Centre were most memorable experiences with Auckland Choral and The Manukau Symphony Orchestra. “Brahms” concert in March 2012 was another great collaboration with MSO and The South Auckland Choral. Our main sponsors are from COGS [ Auckland and Manukau City ], various charitable Trust Funds, MAA members and friends, and local business organisations. 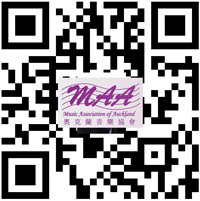 MAA welcomes you to join our association and support our local musicians!